If you had asked grade school Tiffany what her biggest pet peeve was, it would have been the inability to build more than two squares out from the walls on the Sims. But to be fair, the game developers were just using the rules of physics that builders had used for hundreds of years-until 20th century engineering changed the game. A ‘cantilever’ is any structural element that projects out from a building on one side and is left unsupported on the other, an overhang. This is a complete departure from the physics at play in the ‘post and lintel‘ system (a horizontal building piece is supported by two vertical pieces to create two 90 degree angles) that architects have used for several centuries and the cantilever presents a unique engineering challenge. In order to preserve the effect of the cantilever jutting out from the wall, all elements must be kept in a rotational equilibrium. Whereas the post and lintel structure would have two upright structures to counter the downward force of gravity, a cantilever introduces gravitational torque for the engineer to consider. Unsupported loads are susceptible to breakage (See above). Simply put, by not having the second piece to support the other side of the cantilever, things get complicated. So while the cantilever can be very dramatic, it is tricky for the designer to maneuver because the weight of the materials need to be more carefully considered to counter the downward force of gravity (which would cause the element to crash to the ground). Perhaps one of the most bold uses of cantilevers can be found in Frank Lloyd Wright’s Fallingwater. A later work of the great American architect, Fallingwater was completed in 1939 for the Kaufmann family as their weekend home. The Pennsylvania house is perched on the top of waterfall in Mill’s Run. While the original site of the house at the base of the waterfall would have given sufficient support for a traditional foundation, Wright decided that the top of the waterfall would allow his patrons to more deeply connect with their natural surroundings. As a means to compensate for a less than forgiving site, cantilevers were employed to allow for horizontal spaces without requiring that those spaces be supported (to spectacular effect). Indeed the visitors spend more time suspended in thin air than they do on solid ground. This was one of the first times that a cantilever had been used as a component of the utilizable living space, rather than as simply a decorative element on the exterior of the building. To achieve this end, Wright employed reinforced concrete to support the weight of the cantilevers. The use of cantilevers as balconies allowed Wright to maintain his ‘Prairie Style‘ aesthetic, which focuses on dramatic horizontals as a mirror of the planar landscape of the American mid-west, on a site where that design would have been hitherto impossible. Alas, Wright was first and foremost an artist and architect so the project ultimately was a collaboration with a small team of architects, notably Glickman and Peters who had worked with Wright on a previous project. Kaufmann, Wright’s patron, also submitted the house plans to an engineering firm prior to construction but the ensuing drama is a story for another time. Another prominent example of the cantilever in a more modern context would be the Institute of Contemporary Art in Boston. Constructed in 2012 by the firm Diller Scofidio + Renfro, the building was constructed to showcase contemporary art but is a work of art in and of itself. In the legacy of Fallingwater, the ICA features a cantilever integrated into the working space of the museum. 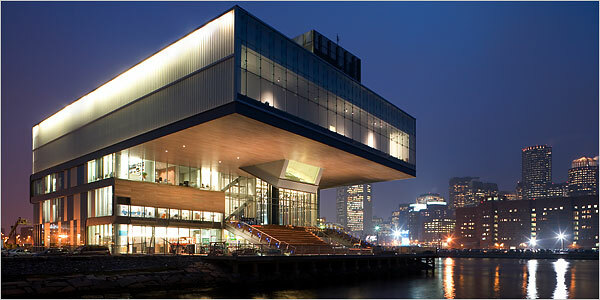 Although there is only one cantilevered section (compared to Fallingwater’s numerous balconies), the ICA suspends visitors over the Boston waterside as well as offering a panoramic view of the harbor. Because this section is clearly separated from the gallery space, it inverts the space and encourages viewers to consider the natural surroundings of Boston Harbor as the art on display. Not simply an impressive feat of engineering, cantilevers can be utilized to great dramatic effect, a metaphorical runway. Fallingwater and the ICA have used engineering to turn centuries of physics on its head and to allow visitors to literally defy gravity.